The famed Stearman Model 75 has its roots in the earlier Model 70, which was chosen in 1934 as the U.S. Navy's primary trainer. At a time when biplanes were becoming a thing of the past, the Model 70 offered the fledgling pilot a steady and sturdy steed. Designed and built in only 60 days, the prototype Model 70 could withstand load factors much higher than were expected to occur in normal flight training. The U.S. Army and Navy tested the prototype in 1934. At the conclusion of these tests, the Navy ordered the aircraft while the Army decided to wait for the introduction of the improved Model 75 appearing in 1936. Over the next decade, the Army received nearly 8,500 Stearmans in five different variants. The difference among these versions were the engines fitted; Kaydets were fitted with Lycoming (PT-13), Continental (PT-17) or Jacobs (PT-18) radial engines. The U.S. Navy took delivery of their first Stearman (called the NS-1) in 1934. Powered with the obsolete but readily available Wright R-790-8 engine, the NS-1 proved its worth as a primary trainer. The Navy purchased several thousand of an improved model, the N2S. The N2S was built in five sub-variants, each variant being equipped with a different model engine. Additionally, the Canadian armed forces took delivery of 300 PT-27s, a winterized version of the PT-17. A later, more powerful version of the Stearman, the Model 76, was purchased by Argentina, Brazil and the Philippines. The Model 76 featured wing mounted .30 caliber machine guns, a bomb rack between the landing struts and a single machine gun for the rear cockpit. These aircraft were used as light attack or reconnaissance aircraft. After World War II, many Stearmans were fitted with Pratt & Whitney 450 h.p. 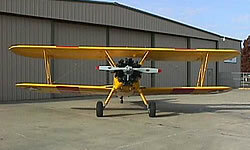 engines and utilized as crop dusters. 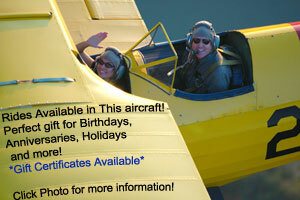 These more powerful Stearmans are also commonly used for wing-walking or aerobatic routines at air shows. 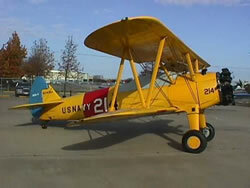 The Cavanaugh Flight Museum's N2S-4 was assembled in 1985 from original Stearman components. 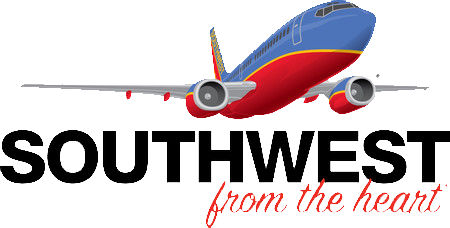 The aircraft is painted in an authentic U.S. Navy paint scheme. ENGINE Continental W-670 220 h.p.